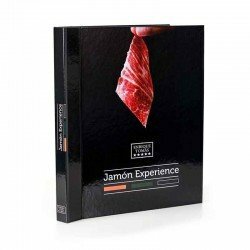 As far as celebrations, birthdays or Christmas parties are concerned, the hysteria of looking for a gift that is up to the circumstances, usually is beyond us, but if you want to avoid falling into monotony and resorting to the same gifts as always, here you have a number of original gifts with Jamón to surprise your loved ones. Thanks to Enrique Tomás' offer, we can find three types of products: boxes and tasting experiences of different types of Jamón and Iberian dry-cured sausages, savings packs made up of Jamón and wines or picos sevillanos, and jamón carving courses. 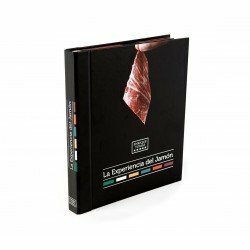 The Book of Experiences is undoubtedly the ultimate gift, a book that includes information about the different types of ham with the slices of each ham and the dry-curing process. It's the only book in the world that you can eat! We also have boxes of 100% Iberian products made up of jamón, chorizo, salchichón and lomo from each of the four production origins. We also have a Jamón tasting box, made up of four packs of each of the four best origins presented. Finally, it is also worth mentioning the Excellence of the Jamón, a gift similar to the previous one, but with a more affordable price and another type of presentation. Choose your own way of thinking about who you want to give your gift to! At Christmas, companies tend to look for original gifts with Jamón that, in addition to this product, include wine or "picos sevillanos" to give their employees and customers in token of good will. 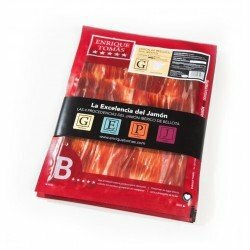 At Enrique Tomás we have several different packs of this style and the difference between them lies in the fact that the meat is either from the shoulder-paleta or ham-jamón and fed with acorn-bellota or cebo-feeding. Thanks to these packs, everyone will be satisfied! Do you know a ham lover who, even if he likes to buy the whole ham or ham shoulder, can't find the right measure to cut the slices properly? 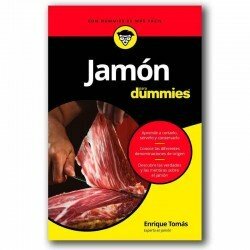 Offer him/her a Jamón carving class! The next time you are invited to eat Jamón, you will see how it will become a gift not only to him or her, but also to you! Classes are held in Barcelona: three hours are more than enough to explain the tools and the cutting technique. Thanks to one of these original gifts with jamón, you will be the centre of admiration for this Christmas!